Thailand, for the 3rd time. It was nice to wake up to birds chirping, but we once again had some miles to cover. Ben, reluctant to get moving. We headed with some of the others to the Tesco in town, and picked up supplies before having a parking lot breakfast. We waved our goodbyes and got on the road, hoping to make it Chiang Mai, where a package of Ivor treats were waiting for us with a friend. 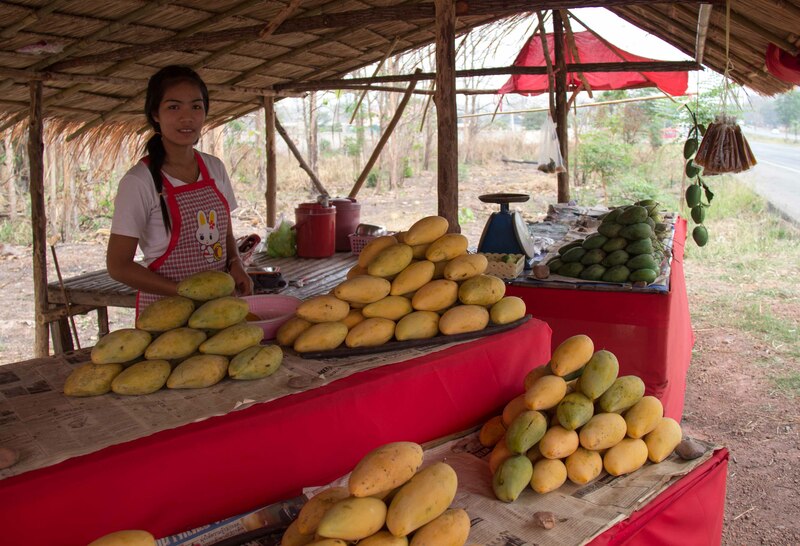 It was mid afternoon by the time we got to the outskirts of the Thai city, and we’d passed a few garages so we decided to stop to investigate getting some Ivor fixes done. After a string of pointed directions and hand drawn maps we found a suspension specialist to look at one of our shock absorbers, and there was a workshop that could do welding next door. It was all that we needed, but since it was getting late, we decided to find somewhere to rest for the night, and to return in the morning to get all fixed up. 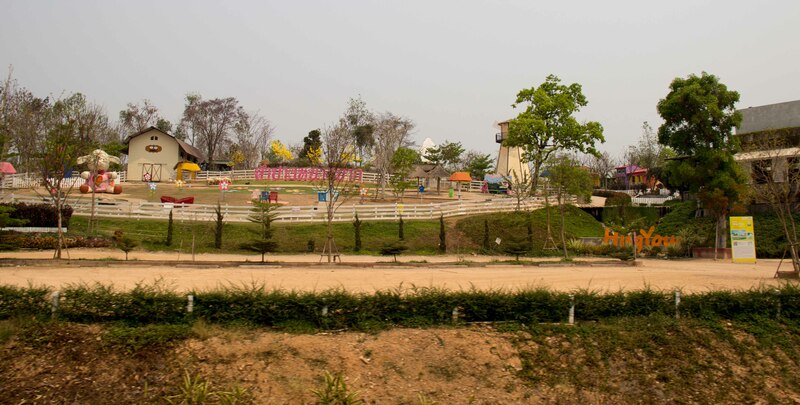 Finding a resting spot is never too easy in a city, and after deciding that some gas station forecourts were too close to busy roads, we turned down a backstreet that looked to have some sports fields on our GPS. The sports fields never materialised, but we did see a church with plenty of parking space. The poor girl there didn’t have a clue what we were asking, but phoned someone who spoke a little English, and who said it was okay for us to stop the night. Getting the metal dust guard welded back to the correct position on our front shock absorber, and having the pineapple can on our exhaust replaced with more substantial metal work was the first job for the day – and they were both achieved far more easily than we’d even dared to imagine. Removing the exhaust had been a dirty job, since everything was covered with a substantial layer of Burmese mud. What can you be hiding from….? … ah, that makes sense. The sympathetic workers at the garage let us use a shower to get the worst of the grime off ourselves. Then it was Ivor’s turn; stopping off on the way into town we handed over a few Baht to get him hosed down and looking presentable once more. 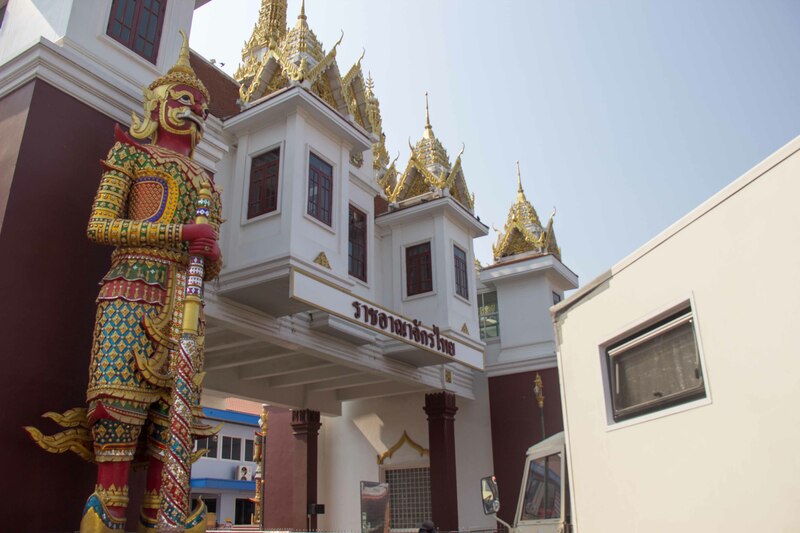 Rosie, who’d taken care of receiving a box of Iveco parts for us, had suggested parking at Wat Suan Dok, not far from her place – and sure enough we found a space just outside the main temple grounds. We went round to collect our mail, and we perched there using the internet for a while as Rosie went out for dinner with a friend. We dined at a little restaurant, with patio furniture that had sprawled out onto the street, and that seemed to be packed with locals – always a good sign. It was literally right outside Ivor, so we had less than 10 meters to walk to bed that night. One of those organising day’s unfortunately – so we searched out a Wi-Fi equipped coffee bar and proceeded to complete French tax returns, to look for Ivor Tyres (since they would need replacing before the long haul back to Europe), and to complete various Visa applications. The evening turned out a little more interesting, and involved a wider variety of animals that we might have imagined beforehand. It started with a couple of beers at relaxed roof-top bar, and then we moved further into town to a bar run by a Belgian guy that we had been to back in December. 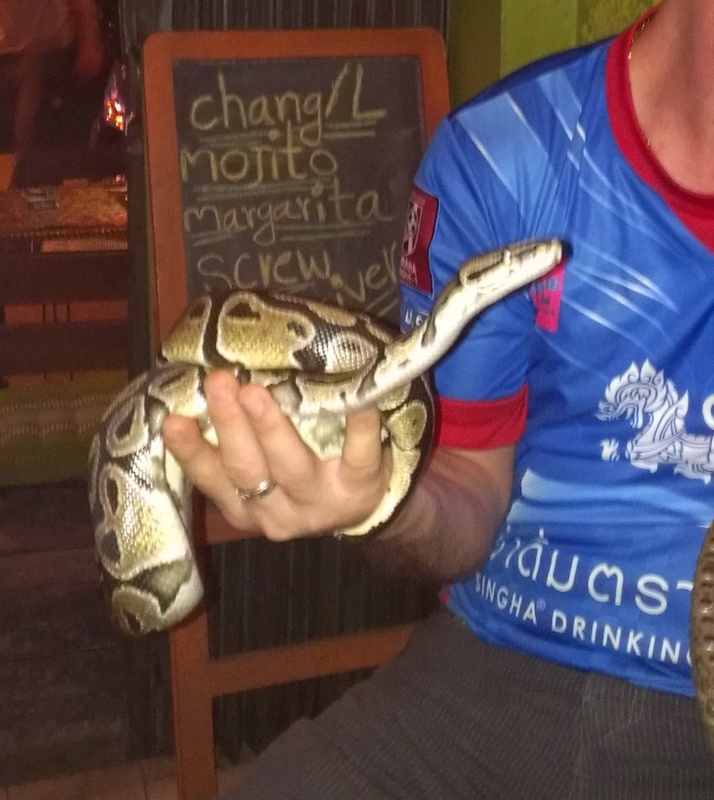 This was our first animal encounter – a guy had brought his pet snake out for the night, strange though it might seem, he claimed that the animal responded well to the stimulation of meeting other people, and to the change from its normal environment. It certainly seemed happy enough, as we petted and held it. Also a surprise was the birdlife we encountered on the journey home. 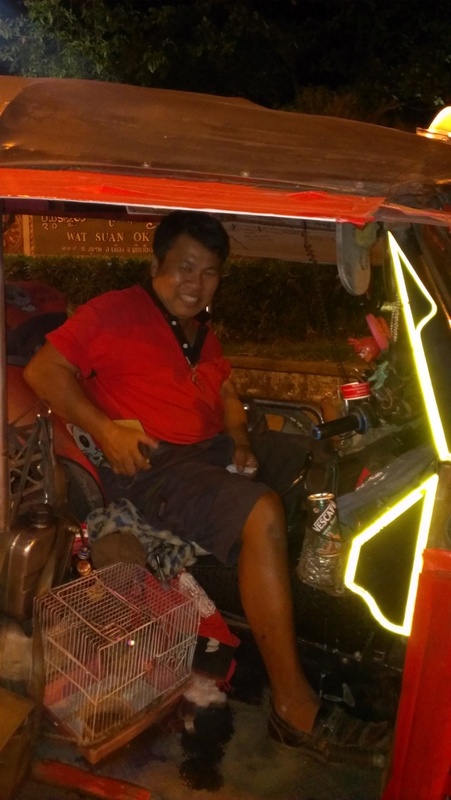 We hailed a tuk-tuk, and found it to be part public transport, part aviary on wheels. There was a variety of small birds in cages, and even an owl. The star of the show was one better trained animal that took a privileged perch on the driver’s shoulder for the duration of the drive back to Ivor. The driver was clearly a bit nuts, but very entertaining. We were up early to join Rosie and her group of walkers for a hike on Doi Suthep, the mountain that overlooks Chiang Mai. The weaving road up, being sat sideways in the back of a Songtau (a kind of taxi), the fumes from the exhaust, and quite possibly the after effects of last night’s beers left us feeling a little jaded by the time we reached the starting point for the hike. With some fresh air in our lungs, we were back on form by the time we started walking. The route was a loop that started from one of the tribal villages, and dropped down through some dense woodland before climbing steadily back via some coffee plantations and sweet smelling kaffir lime trees. It was a mix of expats and locals on the walk, and it was good to talk with such a big group of people that actually lived here and can offer a different perspective on the place to the travelers we tend to come across. We internetted a little at Rosies, and then made our way to the Sunday Walking Market that takes over one of the main roads in the city once a week. Unlike most markets frequented by tourists, this one has quite a lot of original and interesting produce, but despite this we still resisted the temptation to fill Ivor with any of it, instead directing our Baht towards consumable items; street eats. With still a few small internet based tasks to perform, we headed for a coffee shop close to our parking place that conveniently also sold fruit smoothies and waffles with cream and strawberries. Submitting our tax returns was just that little bit more bearable with such an accompaniment. Kim even managed a Skype date with her parents before breakfast. Ivor was feeling a little deflated at the rear driver’s side, so we swapped for the spare, Rosie came round to say “bye”, and we were toddling out of town, headed south. The next big aim was Cambodia, and with a tight schedule we were going to be by-passing any points of interest and just eating up the miles until we hit the border. That night we parked up in a service centre, and used the Cafe Amazon’s Wi-Fi before getting an early night. Up early, since if we got a move on we might even cross into Cambodia this evening. But first things first… we had a flat spare tyre, so V set about wrestling one inner tube out, plugging the sharp edged hole that a bolt had made, causing the puncture in the first place, and wrestling another tube back in. Being out of practice, it took about an hour and a half before the spare was reinflated and placed back in its rightful place on the rear of Ivor’s body. The drive was long and hot, but otherwise uneventful. We decided to take our time stocking up on supplies at a big Tescos rather than to pushing on and making it through the border that evening, we weren’t quite in that much of a rush. 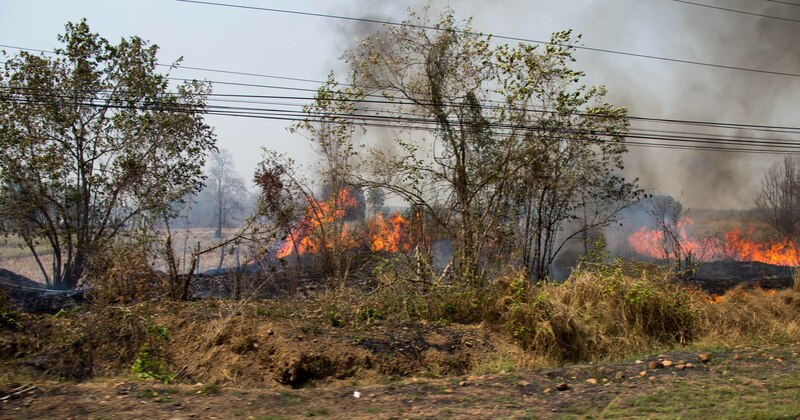 The only real target was to make it to Phnom Pehn with enough time to apply for some Visas before the weekend shutdown. We stopped for the night, but this time there were quite a few Thai’s also doing the same – some had even brought tents. We figured it was because there was a free shower block, and because it was set back a little from the road – that was the reason it suited us so well at least. An easy 62km drive to the border before commencing the paperwork shuffle that is required at these places. We’d overlooked the purchase of Thai insurance when entering the country, so when the border guard requested a copy of our certificate we just pushed a copy of a policy that only covers Ivor towards the guy, claiming that it gave us international cover – the long words in English confused him enough that he stashed it in with another pile of papers and ushered us through. That was it Thailand done for the third and what we thought would be the final time on this trip, more a transit than holidaying so it was a good job we’d done a more thorough tour with Mike back in December. We would actually be making one more day trip to the country a little further down the line, but since the reason is so mind-bogglingly exciting, we’ll keep it under wraps until later on in the blog, probably the Laos posting. The world is a largely friendly place we find, so full of remarkable, ordinary people. So glad that you seem to find the same. We will reread your blog when we get home to a proper computer that does pictures. Keep enjoying it. Sorry we missed you in Mongolia!